We’ve been monitoring the volume of traffic to GOV.UK since launch. We want to ensure that the people who used to rely on Directgov and Business Link can still find the reliable and authoritative information and services they need. 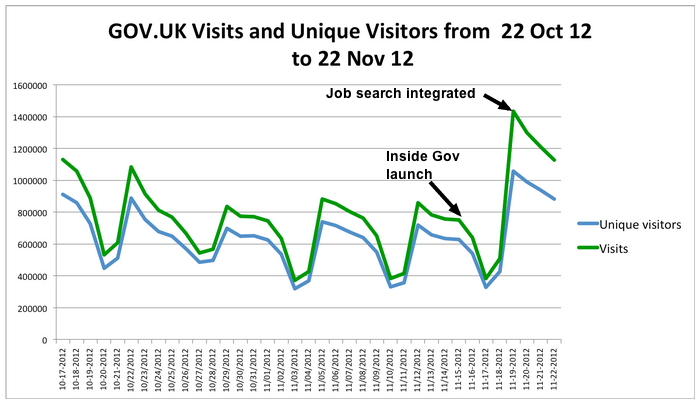 As the GOV.UK dashboard shows, and some followers have commented, the numbers of visits and unique visitors have fallen since the first week after launch. So what’s been going on? I’ll start with some caveats. Firstly, GOV.UK, Directgov and Business Link all use different analytics software, implemented in different ways. The figures are not calculated in the same way. Nevertheless, our benchmarking shows that comparing trends across the three sites is a worthwhile exercise. Secondly, I’ll focus on the month or so after GOV.UK came out of beta, but before the first iteration of Inside Government and before the job search entry page moved to GOV.UK. 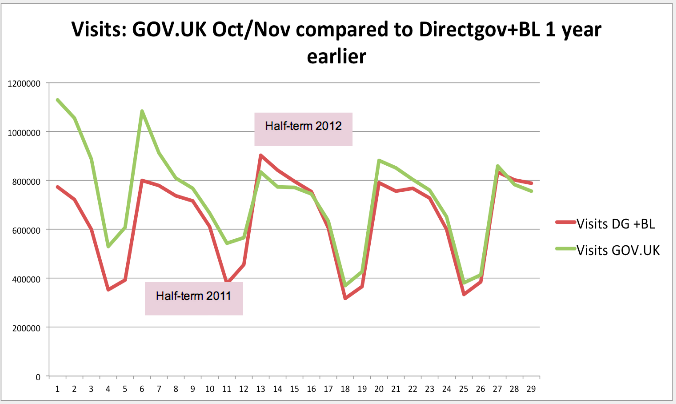 This gives us the closest comparison of Directgov and Business Link traffic to GOV.UK. But what do the metrics look like on a daily basis? Note: the visits to unique visitors ratio is consistent at 1.2:1. 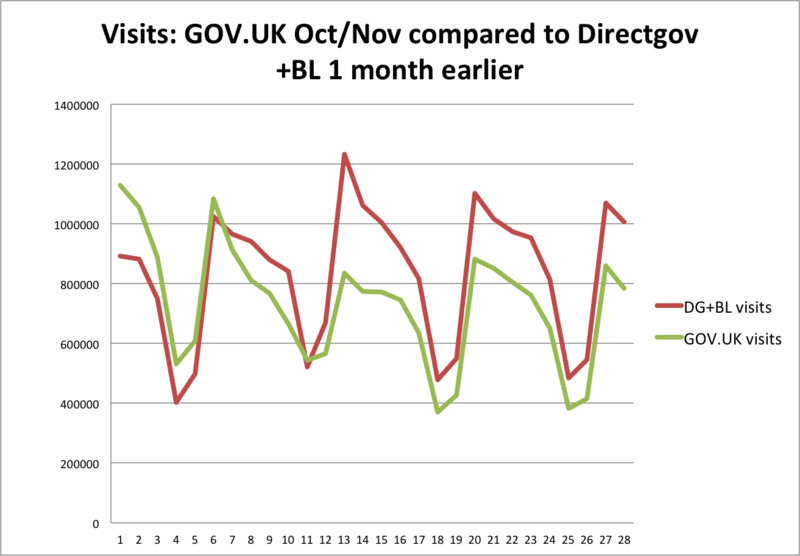 If we compare GOV.UK data for October and November, against Directgov and Business Link a month earlier in September and October, the data looks more worrying; with visits down 12% and unique visitors down 20%. But looking back over the past month doesn’t really give us enough context. So how did Directgov perform over the last two years? Looking at the Directgov monthly visits, we noticed two things. Firstly, there’s a strong seasonal pattern with traffic falling off in the autumn. Secondly Directgov performed well in 2012. 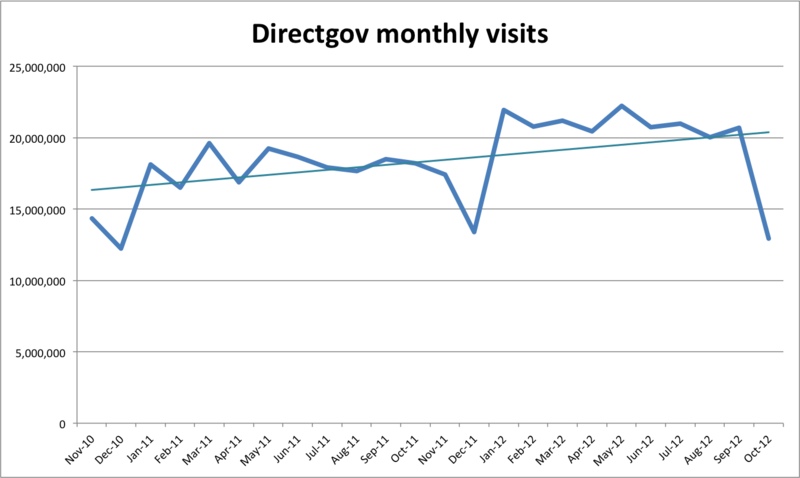 So we overlaid the number of Directgov and Business Link visits for the month starting 19 October 2011 with the GOV.UK data for a year later, starting 21 October 2012. 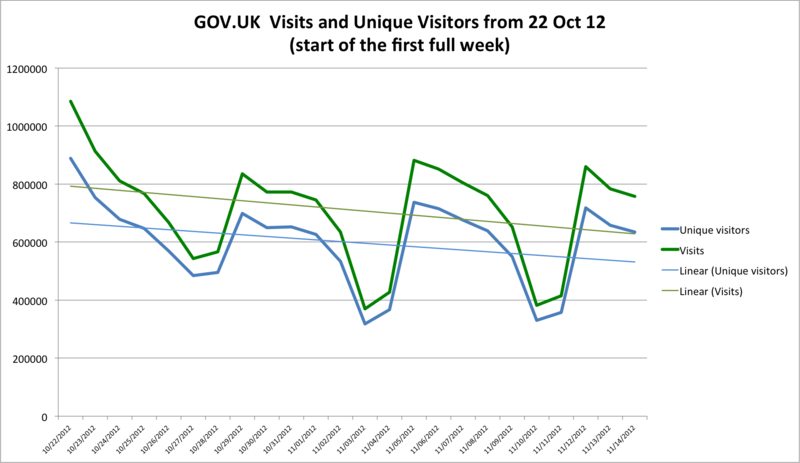 Over the month, visits to GOV.UK increased by 14% and unique visitors increased by 3%. So we think the biggest influence on traffic trends is this strong seasonal pattern. We’ll start investigating whether particular topics and services are less in demand in the autumn or whether there is a more even distribution of the tail off. This is useful insight for our content designers who ensure that seasonal topics are highlighted at the right time of year. Of course, the launch of Inside Government and the move of additional government services to GOV.UK will impact significantly on traffic. We’ll continue to monitor 'like for like' traffic for a while, but we'll focus on GOV.UK’s own traffic patterns as the site evolves. Traffic is falling because people do not trust the website, no once would believe that a Government designed website could look so poor, forget about the functionality the best thing people notice is how a website looks. When you come across this site it looks like a total joke. Ive seen self employed plumbers with better websites that this. How about some colour? Some images? Would it really be that much more expensive? This part of the Direct.Gov franchise is great: https://nationalcareersservice.direct.gov.uk/Pages/Home.aspx why are all the sites not to this standard?